Gorman’s second half goals preserve Paddy Henry’s proud Cloonacool record as Sligo LGFA manager. 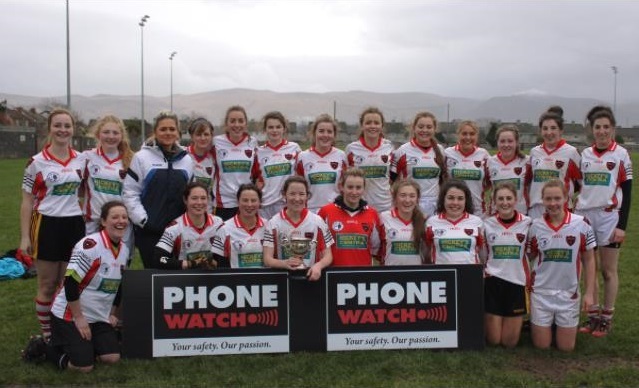 Sligo Ladies made it 2 home wins out of 2 following this 2 point victory over Waterford on Sunday in -what could very well become known as a Fort Knox venue for Paddy Henry – Cloonacool Community Park. Trailing by 5 at half time, Sligo turned the game around in the second period to successfully defend their home record at the Cloonacool venue. In a lively opening quarter, Sligo were guilty of missed opportunities. They had 2 points on the board but at least 2 goal chances had gone a begging with Waterford recording 4 points – 2 each from Ger Power and Lauren Mc Gregory- to lead by 2 after 15 minutes, Sligo’s 2 coming from Ciara Gorman with Power’s 11th minute score being the pick of them. Roisin Tobin and Emma Murray added points before Sligo were thrown what appeared to be a lifeline, being awarded a penalty in the 20th minute as Stephanie O’Reilly was fouled in the box. Waterford goalkeeper Jessica Fitzgerald batted away Mary Ann O’Kennedy’s effort to preserve the visitors lead. Things then got worse for Sligo as Nicola Fennell and Anne Wall added points for Waterford to leave a 7 point gap between the sides with 7 minutes remaining to the short first half. Worse was to follow at first for Sligo as Ann-Marie Coleman was sin binned but after this the tide began to turn for them as first Michelle McNamara blocked a point blank goal bound shot for a 45, then at the other end Stephanie O’Reilly and Karen Maloney sent over to leave them 5 in arrears at half time. Lauren McGregor converted a free for Wateeford some 2 minutes into the second half. Strangely enough by the time their next store would arrive, they would be chasing the game as Sligo took over in the scoring stakes but possession was fairly evenly matched except the home side appeared to be the better finishers. Ciara Gorman kick started the Sligo comeback with a 7th minute free. From the resulting kick out Karen Maloney provided a boomer from distance to cut the gap to 4. A Ciara German goal in the 9th minute had the gap down to one. Some five minutes later Sligo would hit the front when a super cross field pass from Karen Maloney picked out Ciara Gorman. Gorman’s point effort dipped at the 11th hour, deceiving the visitors keeper with the umpire going for the Green flag instead of the white one. Gorman tagged on a free in the 16th minute to push the gap out to three. With Sligo defending their lead all Waterford could produce in the final quarter hour of the game was a point and 2 wides as Sligo, Paddy Henry and Fort Knox held firm to ensure a second league win of this campaign and edge Sligo closer to a semi-final place. Next up for Sligo is a trip to Laois on Sunday next but for now Paddy and the crew can savour this latest win. 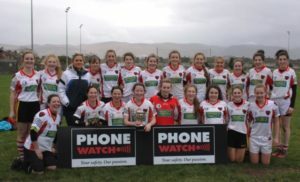 Sligo made the trip to Omagh with the hope of getting their 2017 Lidl NFL off to a winning start, Boosted by the return of Captain Noelle Gromley from injury Paddy Henry was looking for a good team performance in Omagh. Tyrone started the better of the two team hitting 2 point in the first five minutes though Emma Smyth and Meabh Mallon. Sligo first score came from the boot of Ciara Gorman from 20 yard free. The best score of the first half came from Tyrone’s Niamh O’Neill when she hit a point off her left foot 25 yards out. Ciara Gorman kept Sligo in it with her free taking. Tyrone hit back with a Gemma Begley point before Laffey pointed for Sligo to leave it a 1 point game 15 mins played. Tyrone scored the next two points from O’Neill before Laura Ann and a free from Gorman left 2 points between the teams at half time. Niamh O’Neill got Tyrone off the mark for the 2nd half with a point after great build up play from Mallon and Hunter. Gemma Begley free but 4 between the teams before Gorman score her 4th point of the day. On 17 mins Stephanie O’Reilly played a one two with her club mate Bernice Byrne before hitting a wonderful point from 25 yards. Sligo made two subs with Sinead Naughton and Rachel Monaghan replacing McGrath and Casey. Both team exchanged sores before Tyrone Gemma Begley found the back of the Sligo net to give Tyrone some breathing space but Sligo hit back almost straight away with a goal from Gorman but it was not enough for the Sligo ladies Tyrone running out 4 point winners 1-14 to Sligo’s 1-10. Next up is a home game next Sunday in Cloonacool 2pm when Westmeath will provide the opposition. 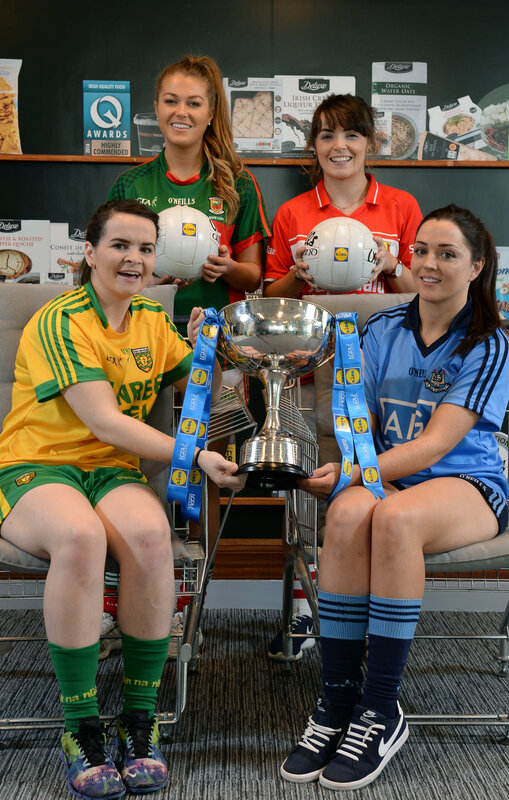 Lidl today announced plans for the second year of their partnership with the Ladies Gaelic Football Association at the launch of the 2017 Lidl Ladies National Football League. Following on from the phenomenal success of the #SeriousSupport campaign last year which saw the retailer pledge to invest over €1.5 million in Ladies Gaelic Football in year one, Lidl today commits to the same level of support for the season ahead. The 2017 Lidl National Football Leagues have the potential to be the most keenly contested in recent years with intense competition across all 4 Divisions. All eyes will be on Cork in Division 1 of the Lidl National Football League as speculation surrounds the future of some of their biggest name players. However, such is the depth of talent available to the Rebellettes that they will enter the campaign as favourites to make it a fifth title in a row. The addition of Donegal to the top grade means that all 8 teams are very evenly matched as all have the potential to reach the knockout stages. There will be a lot of interest in Dublin and their new manager, Mick Bohan, who will begin their campaign to make up for recent disappointments. Waterford will start their first campaign in Division 2 as favourites for back to back promotion but they will have their work cut out for them in what will be a very strong division with the likes of Westmeath and Cavan along with the TG4 Intermediate All Ireland finalists Kildare and Clare. Tipperary will bear the weight of expectation as they enter their Division 3 campaign as favourites for promotion and their new manager, Shane Ronayne, will hope to use all the experience he gained from working with Cork legend, Eamonn Ryan, to steer the Premier County to the top of the table. In Division 4 there is a welcome return to the National League for Kilkenny who contest their first National League in several years and they will hope to hit the ground running and make an immediate impact. The next phase of the campaign is entitled “Serious Starts Here” and sees Lidl investing further in the LGFA where it counts most – at local level and in the community. This is where serious support is born and nurtured – through the dedication of a local community. It all begins with a school or a club and Lidl wants to help make the support for players strong from the start so young female talent is given its best chance. The first phase of the campaign will see an above the line regional campaign launched featuring 8 counties. The creative will show a county player, a player from their club and a player from their school, with the tagline “Serious Starts Here”. Throughout the year then Lidl will run various initiatives for the benefit of clubs and schools, following on from the successful kit donations last year. Sat 18th February, 2017 – venue St. Pat’s, Dromard. All clubs expected to have at least three persons in attendance (it is only required to attend on EITHER day). The participants must be 16 years or older and the course will last from 10 am sharp – 4 pm. The course fee will be €20 per person which will include resources and certification and lunch will be provided on the day. It is expected both courses will fill up quickly so early booking is advised through my email – kmkane@eircom.net or by text to 086 2400844. Please pass this information on to all interested parties in your club. Please see details below of County under Age Trials this weekend. Please inform all your club plays of the trials. Minor 2017 trials/training Saturday 21st Januray at 11am in Ballymote . Girls eligible pls contact Tracy by text 0874110568 with following details, name , D.o.b. Position u play. U14 2017 trials will take place on Sunday in Kevinsfort @10.30am to 12.30pm. All Girls are asked to be there at 10.15am. We are delighted to announce the opening of the 2017 LGFA Gaelic4Girls Programme! In 2013, the Gaelic4Girls programme was revamped and re-launched with the aim of making the programme more attractive to clubs, to assist any struggling clubs, established clubs looking to expand their numbers at underage level or any potential areas where new clubs may evolve. The programme has proven to be a very useful tool for our clubs in terms of strengthening their underage structures by recruiting new players. Most Clubs have experienced at least a 50% retention rate of the new players following the programme. In 2016 43 Clubs representing 23 Counties were successful in their application. Any Club can apply to be a part of the programme. Criteria have been outlined and it’s up to a Club to justify why they should be chosen. Clubs have between now and the 20th January to apply. Following this, the County Development Officer, Provincial Development Officer and a member of the National Development Team, will discuss the applications and decide together, which two sites within a County are the most appropriate. A maximum of 2 sites can be selected from your County to participate in the Programme. There are numerous benefits to the programme with the most obvious to increase numbers in your club, but also there is free training provided to your coaches and resources are provided free of charge for the promotion of a National Programme taking place in your club. Additional information plus the relevant Provincial Application Forms are below. We would ask you to please forward this information to all clubs in your County and promote on your website and social media outlets. If you have any queries please do not hesitate to contact Paula Prunty (paula.prunty@lgfa.ie) or your relevant Provincial Development Officer. To apply on behalf of your club simply choose you province and download the appropriate form. Minor 2017 trials/training Saturday 21st jan at 11am in ballymote . Girls eligible pls contact Tracy by text 0874110568 with following details, name , D.o.b. Position u play. On Tuesday night Connacht LGFA held their AGM and Sligo’s own Liam McDonagh​ took over as President for the next 3 years, having been President Elect for the past year. Liam has been involved in ladies football for the past 25 years with his club St Nathys and in Connacht, from training teams of all ages to chairperson of Sligo LGFA and for 5 years he was vice President of Connacht LGFA. Liam has always given his all for ladies football and I am sure the next 3 years will be no different. Liam will have a Sligo man by his side as well for the next year as Ted Maloney​ was returned as Vice President for a second year. Keith Gilroy​ was also returned as PRO for the coming year. We would like to wish Liam ,Ted and Keith the very best of luck in their roles for 2017. The following officers were elected to Connacht Ladies Gaelic Football Council for 2017. The plan, which will be a 6 year plan, will chart the future of Ladies Gaelic Football into the future and will act as a framework for the growth of the game. The annual Páidí Ó Sé tournament takes place again on the 17th, 18th and 19th of February and spaces are still available for clubs interested in playing in the very competitive women’s section of the competition. If you or your club are interested in making the trip to the Dingle Peninsula to take part in this brilliant festival then contact Padraig on 097 9155784 or email padraig-is@hotmail.com. Copyright © 2014 Sligo Ladies Gaelic. All Rights Reserved.